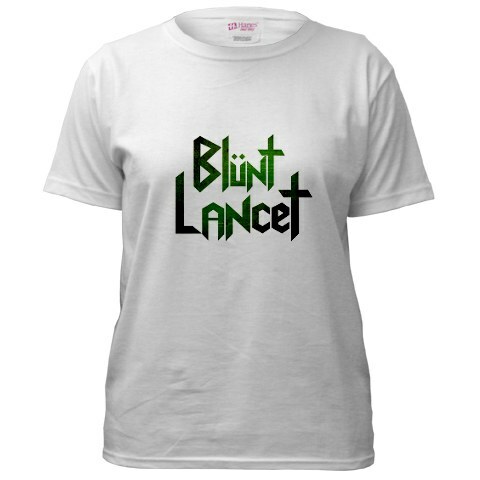 Texting My Pancreas: Blunt Lancet: Got Merch? Holy shots of insulin, guys. I had heard rumors about Blunt Lancet's comeback, but I had no idea it would progress to anything this awesome. Have you checked out Diabetes Mine today? They've featured my favorite "band" today, and announced that there is an actual merch store you can buy real things from. Kudos to Kelly Rawlings of Diabetic Living magazine for pulling that all together, and finding a way to support the Diabetes Hands Foundation in the process. I'm totally wearing a Blunt Lancet t-shirt to my next endo appointment. Dude! That's awesome! I so want one, and have to sport it to my next Endo appointment, too. All the cool kids are doing it.